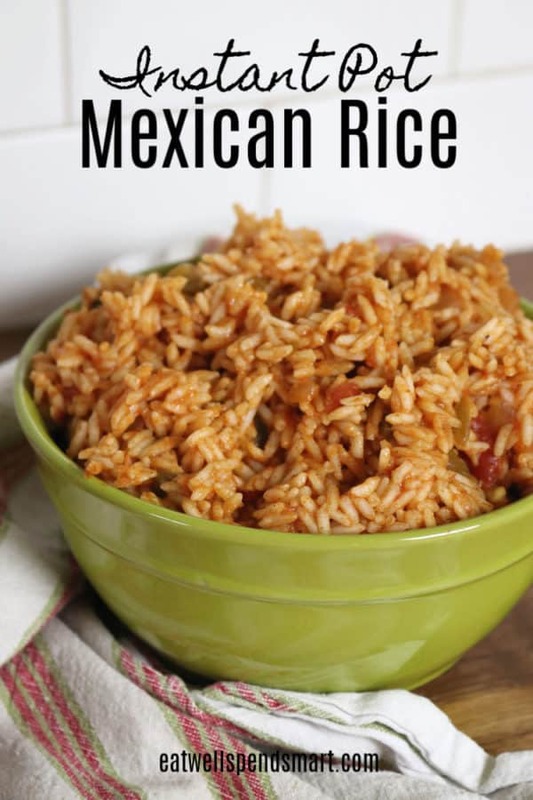 Instant Pot Mexican rice is a perfect simple side dish to accompany any Mexican recipe. It cooks quickly in the Instant Pot and yields perfectly cooked flavorful rice. It’s Tara again from Eat Well Spend Smart. 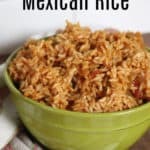 I’m glad to be back to share with you another easy recipe, Instant Pot Mexican rice. On my blog I like to share everyday recipes for the home cook that offer great flavor, but are also affordable. One of my strategies that I use in my own home to stretch the main dish a little further is to serve it with lots of filling and inexpensive side dishes. Rice is a great option that I use frequently. It is extremely versatile, budget-friendly, and a great pantry staple. When making chicken enchiladas or fajitas, I may not have leftovers for lunch the next day because I have a hungry family that likes to eat! If I take a few extra minutes and add a filling side dish of Instant Pot Mexican rice, I can make it stretch just a little further. Leftovers are life around my house at lunch time! If you are wanting a Instant Pot main dish Mexican rice, try my Instant Pot Taco rice with ground beef and beans. It’s one of our favorites! 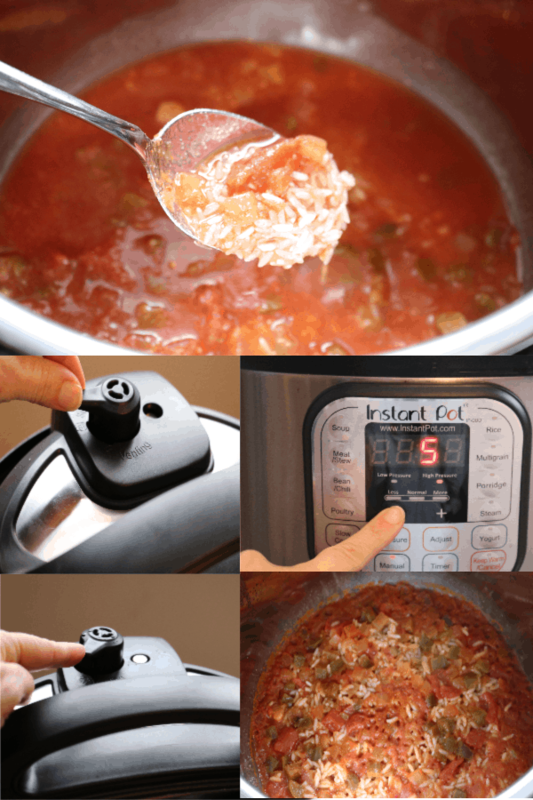 It is extremely easy to make in the Instant Pot. My method is completely hands-off and requires no chopping. Yes! I use ready-made salsa instead of chopping onions, peppers and tomatoes, because it’s so much easier for this busy mama. Salsa gives it a great flavor and I seem to always have it on hand. I’ve tried this with several different kinds of salsa and they all work fine. There are just a few steps to this quick and easy side dish. Stir rice, salsa and spices together in the Instant Pot insert. Place the lid on the Instant Pot, making sure the valve is set to “sealing”. Manually set the pressure on high for 8 minutes or the automatic “rice” button. When time has elapsed you can choose between a quick pressure release or a natural release depending on how much time you have. Why use the Instant Pot for rice? I love my Instant Pot for rice for a few different reasons. Good texture: To me, rice cooks wonderfully in the Instant Pot because there is very little evaporation that takes place. All that liquid goes into the rice and yields a tender grain. If you are ending up with crunchy rice, your Instant Pot may be functioning differently than mine and you may need to cook a little longer next time. Your grain of rice may be more plump than mine as well. Hands off: I like that there is no babysitting for me to do when using the Instant Pot. I can set it and forget it and worry about the main dish. Speed: This one is controversial. I see it as a time saver, but the time it takes to come to pressure and release (if you are using the natural release method) is something to take into consideration. Just because a recipe states 8 minutes of cook time, there is also a few minutes of time that it takes to come to pressure and maybe about 10 minutes of time to naturally release. If you are in a hurry, use the manual high pressure time and do a quick manual release. 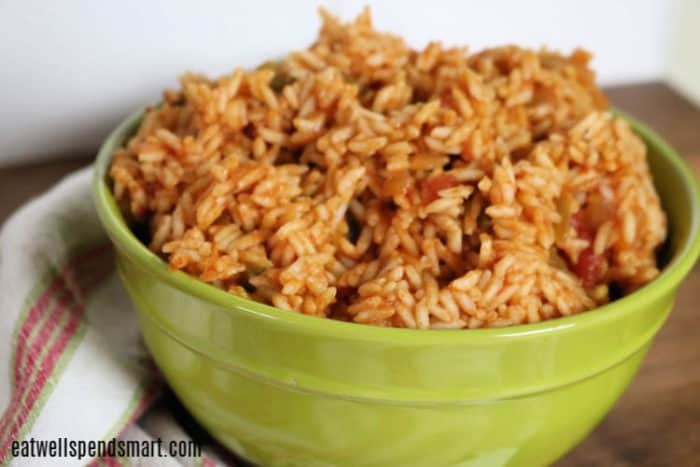 Instant Pot Mexican rice is a perfect side dish to accompany any Mexican recipe. Super simple recipe that has no chopping, just dump it in and cook. Simple dump and go Mexican rice dish. Add ingredients, set the Instant Pot, and enjoy. Place all ingredients in Instant Pot liner and stir. Close lid and make sure valve is set to sealing. Set to either manual 8 minutes on high or the rice function button (low 12 min). To release pressure, you may manually release if you are short on time. You may end up with a wetter grain, but it's still good. If you have time to kill, you may allow it to naturally release pressure on its own. After pressure is released, remove lid and fluff with a fork. Serve hot. Hello! I’m Tara from Eat Well, Spend Smart and I help families learn how to eat well even when money and time are tight. Visit my site for budget-friendly healthy recipes, money saving strategies, gardening tips, and tasty meal plans.